I never knew Grandfather Demos – he died before I was born – but I must have heard the stories about him a thousand times. I knew each detail so well that as I sat now looking out at the orange trees silvering in the moonlight, I seemed to be seeing another landscape, far away and long ago. This isn’t hard for an Armenian. We’re Old Testament people, the past and the present so woven together in our minds that what went on a hundred or a thousand or two thousand years ago is as real to us as the date on the calendar. I’d heard it described so often that I could actually see the little village of Kara Kala sitting solidly in the rocky foothills of Mount Ararat – the mountain, so the Bible tells us, where Noah’s ark came to rest. Closing my eyes I saw the stone buildings, the sheds and barns, and the one-room farmhouse where my Grandfather Demos lived. In that house Grandfather’s five daughters had been born – but no son – and that was a disgrace among the Armenians, as much a disgrace as it was among the ancient Israelites. I could picture Grandfather walking to the house-church each Sunday morning with his five little girls. Although most Armenians were Orthodox, Grandfather and many others in Kara Kala were Presbyterians. I could see him marching through the village to the house where church was meeting that particular Sunday, his head held high in the face of the silent reproach. In view of his great need, it has always seemed surprising to me that Grandfather did not accept right away the strange message that had been trickling over the mountains for nearly fifty years. The message was brought by the Russians. Grandfather liked the Russians all right, he was just too levelheaded to accept their tales of miracles. The Russians came in long caravans of covered wagons. They were dressed as our people were, in long, high-collared tunics tied at the waist with tasselled cords, the married men in full beards. The Armenians had no difficulty understanding them as most of our people spoke Russian too. They listened to the tales of what the Russian called ‘the outpouring of the Holy Spirit’ upon hundreds of thousands of Russian Orthodox Christians. The Russians came as people bringing gifts: the Gifts of the Spirit, which they wanted to share. I could just hear Grandfather and Grandmother talking late into the night after one of these visits. One had to admit, Grandfather would have said, that everything the Russians were talking about was Scriptural. ‘I mean, healing is in the Bible. So is speaking in tongues. So is prophecy. It’s just that the whole thing doesn’t sound …. Armenian’. By which he would have meant trustworthy. Down-to-earth. Practical. And Grandmother, her heart forever heavy, might have said, ‘You know, when you talk about prophecy and healing, you’re talking about miracles’. And then Grandmother might have started to cry. I know for a fact that on a certain sunny morning in May, 1891, Grandmother was weeping. Over the years several families living in Kara Kala had begun to accept the message of the Russian Pentecostals. Grandfather’s brother-in-law, Magardich Mushegan, was one of these. He received the Baptism of the Holy Spirit and on his frequent visits to the Shakarian farm would talk about the new-found joy in his life. On this particular day – May 25, 1891 – Grandmother and several other women were sewing in a corner of the one-room farm house. That is, Grandmother was trying to sew, but tears kept falling on the material in her lap. Across the room, next to the window where the light was good, Magardich Mushegan sat with his Bible open on his knee, reading. Suddenly, Magardich snapped his Bible shut, got up and walked across the room. He stood in front of Grandmother, his heavy black beard bobbing up and down in his excitement. ‘He’s given me a message for you’, Magardich said: ‘Goolisar, exactly one year from today, you will give birth to a son’. When Grandfather came in from the fields Grandmother met him at the door with the news of the wondrous prophecy. Pleased, wanting to believe yet still skeptical, Grandfather said nothing. He only smiled and shrugged his shoulders – and marked the date on the calendar. The months passed and Grandmother became pregnant again. By this time everyone in Kara Kala knew of the prophecy, and the whole village waited in suspense. Then, on May 25, 1892, exactly a year from the day the prophecy was given, Grandmother gave birth to a baby boy. It was the first time our family had encountered the Holy Spirit in this personal way. Everyone in Kara Kala agreed that the choice for the little boy’s name was perfect: He was called Isaac, for he was, like Abraham’s own long-awaited son, the child of promise. I’m sure it was a proud and happy man who paraded his family to church each Sunday after Isaac was born. But Grandfather had a stubborn streak in him – all Armenians do. He considered himself too tough-minded to accept without reservation that he had witnessed a supernatural prophecy of the sort mentioned in the Bible. Maybe Magardich’s prediction had been merely a lucky chance. And then – all in one day – Grandfather’s doubts disappeared once and for all. 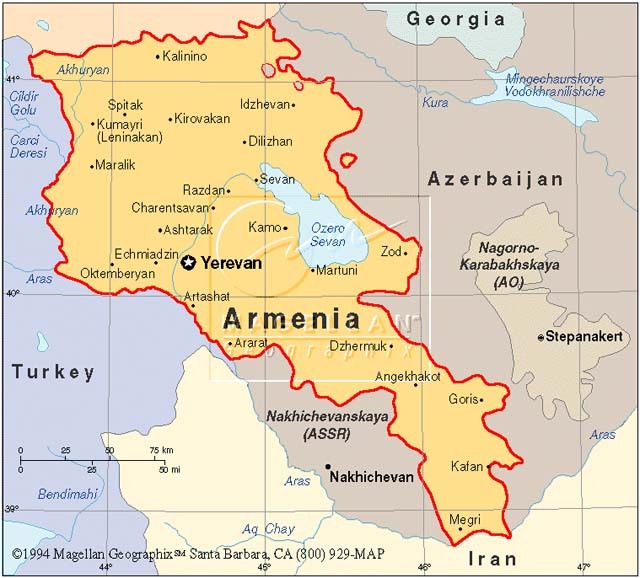 This entry was posted in Armenia, revelations, Testimonies and tagged armenia, Demos Shakarian, kara kala, revelation, The Happiest People on Earth. Bookmark the permalink.